For almost anyone who grew up playing video games in the 90s, Super Mario 64 was a blocky rite of passage. But it’s not just gamers who have taken to the mustachioed hero lately. More recently, scientists have to begun to test whether games like Super Mario 64 could be used to keep people mentally in shape, thanks to its colorful landscapes, simple-yet-addictive puzzles, and open-world freedom. 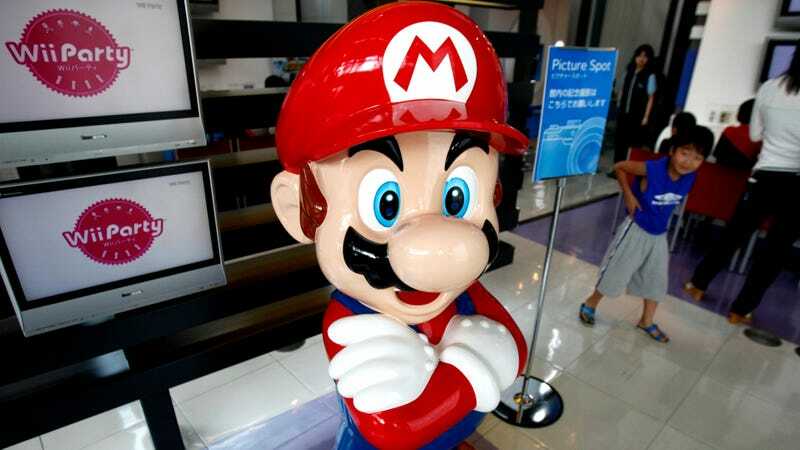 To that end, a study published last week in PLOS One suggested that elderly people who keep up a daily regimen of Super Mario 64 can increase the amount of gray matter in their brain, and even improve their short-term memory. Unfortunately, the enthusiastic reception this research has been getting online says more about the media than how close we are to a brain-boosting prescription straight from Dr. Mario. To sum it up, the study found that healthy volunteers (all from the ages 55 to 75) who played Super Mario 64 for at least 30 minutes a day, five times a week, for six months, performed better on a test that measured their short-term memory afterward than they did before they started playing. Via brain-imaging scans, it also found these people had an increase of gray matter—the gushy tissue that contains our neurons—in the hippocampus, which among other things helps us store memories, and in the cerebellum, which helps with coordination. These differences in the Mario-playing group (let’s call them Toads) were contrasted with two control groups: One group that was taught and asked to regularly play piano, and another group that was simply told to come back six months later to retake the same batch of brain and memory tests. The Toads were the only group to show improvement on the memory test. But both the Toads and piano-players showed growth of their grey matter, though not always in the same areas of the brain, while the stay-at-home group experienced an overall decrease of grey matter. This growth in the hippocampus, lead author and University of Montreal psychologist Greg West told me, is interesting because “we know from a large body of previous research that people with more gray matter in their hippocampus are less at risk of developing certain neuropsychiatric illnesses,” like Alzheimer’s Disease and other forms of dementia. The study, according to the authors, is the first to suggest that training older people to play video games can seemingly have a direct effect on their hippocampus. All well and good. From there, however, media outlets went on to blast in their headlines that “Playing Super Mario 64 prevents dementia” or that it “could save your brain from Alzheimer’s,” a conclusion that even West thinks is too strong a claim. Leaving hype aside, many of these write-ups fail to mention any of the study’s glaring weaknesses. First and foremost, the study is incredibly small, as Ioana-Alina Cristea, a psychologist at Babes-Bolyai University in Romania, pointed out to me. There were a total of 33 volunteers, with only eight in the Mario-playing group. More worrying is how the researchers recruited and selected those subjects. Originally, they had 15 volunteers in the group, but 11 dropped out, largely because they couldn’t get the hang of playing the game. The researchers then decided to recruit four more willing volunteers after the study began, but without randomizing them. “Without even realizing, the authors could have pre-selected participants that they thought might have been more adherent or more interested in the intervention or any other systematic difference that would make them respond better to the intervention. We have no way to assess this,” Cristea said. There are other strange quirks too, Cristea said, like how the control group didn’t experience any decrease of their short-term memory, as you might expect since the gamers were shown to improve their memory and amount of grey matter in the hippocampus at the same time. Given the small study size and the statistical methods they used to compare the groups, Cristea concluded, it’s most likely that “there are probably no effects (or at most minute and unstable effects),” and that any the study found were flukes. However, Cristea’s criticisms weren’t echoed by other experts I spoke to. Yaakov Stern, a neuropsychologist at Columbia University, noted that many of these weaknesses were addressed in the paper itself, and he found the study an encouraging “mini-step” in illustrating the potential of video games as a way to sharpen people’s mental prowess as they age, one that larger studies will need to prove. West, the study’s author, responded that the paper is meant to be a first proof-of-concept that replicates what researchers have already noticed in younger people. Indeed, all published studies should be considered steps toward our greater understanding of a topic, rather than the final word. But when media outlets overhype a finding or neglect to provide qualifying context and disclaimers, readers end up with a misleading picture of how science really works. And that erodes the trust people have in both journalists and scientists alike. So go ahead, boot up your ancient Super Mario 64 cartridge (or download it onto the Virtual Wii), and collect all 120 stars for old times’ sakes. Just don’t play it in the hopes you’ll be preventing dementia. At least not yet.